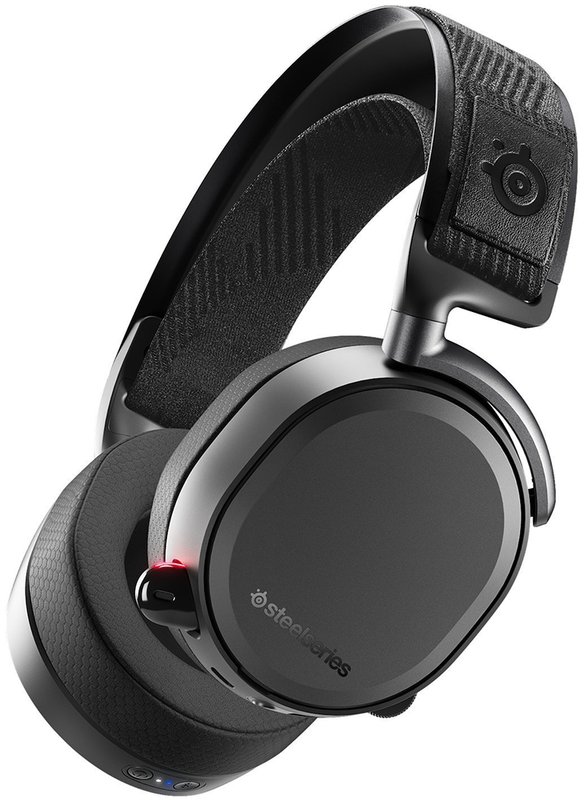 SteelSeries has updated its range of award-winning headsets with three new models launched under the Arctis Pro umbrella. The trio arrive as high-end successors to the hugely popular Arctis 7 line, and with multiple flavours to choose from, pricing can vary considerably. The most basic model, dubbed simply the Arctis Pro, is a wired solution priced at £180. Up next is the Arctis Pro GameDAC, which for £250 adds an ESS Sabre digital-to-analogue converter and high-res audio certification. At the top of the range lies the Arctis Pro Wireless, a £300 offering the ability to roam free on PC, PS4 or mobile. We have the flagship in for review today. Those who have been keeping tabs on the Arctis range will immediately recognise the Pro Wireless cans. Available only in black, the headset has the look and feel of a quality unit. Aluminium alloy and steel construction contribute to the robust construction - there are no squeaks whatsoever - while weight is kept to an agreeable level. We've tried our fair share of gaming headsets over the years and it wouldn't be a stretch to say that Arctis Pro Wireless is one of, if not the most comfortable to date. The cushions are fantastically soft and wrapped in an Airweave fabric, while the ski-goggle headband continues to do an admirable job of finding the right fit. Your ears do inevitably get hot after prolonged use, as is the case with all over-ear designs, yet we'd happily wear these for a few hours uninterrupted. It is always nice to see a gaming headset adopt a simple approach to aesthetics and if you prefer not to stand out on the train, you'll like the fact that, in an effort to save battery, the Wireless headphones are the only ones in the Arctis Pro range not to feature RGB lighting. The tip of the retractable mic will glow red to indicate mute, but other than that it's a sleek-looking affair. Looking the part is all well and good, but the headset also needs to be functional and SteelSeries borrows from years of experience to ensure that all the right buttons are in all the right places. The left can is lined with a good-sized and textured microphone mute button, a rubberised and notched volume scroll wheel, a mobile audio cable jack, a headphone sharing jack (3.5mm, for sharing audio with any other headset), and micro-USB for charging. Over on the right are Bluetooth and power buttons, with the latter sitting slightly proud, and all the controls are easily identifiable when in use. One important consideration with wireless headsets is battery life, and SteelSeries quotes an average 10 hours of use from a single charge. That isn't a huge amount and regular recharging could be a nuisance, however the Arctis Pro Wireless has an answer for that by shipping with two batteries. One is located behind the right cap and, when it runs dry, can be swapped for the other battery that has already been charged in the bundled wireless transmitter. Designed to sit on your desk or in the living room alongside your TV, the wireless transmitter is a compact unit with a small display, control knob and back button lining the front face. The right side offers a slot for charging the spare battery, while the back of the unit is home to line-in, line-out, DC power, mini USB and optical in and out. The headset is pre-paired to the transmitter via 2.4GHz wireless, offering a range of up to 40 feet, but also touts Bluetooth 4.1 connectivity, ensuring compatibility with various mobile devices. It is interesting to note that both can be used simultaneously, meaning you can mix a Bluetooth phone call with your 2.4GHz game audio. SteelSeries bundles enough cabling to cater for just about any usage scenario, however the wireless transmitter does have its shortcomings. It's very handy on a desk where the display is readable and the controls accessible, but in the living room it is likely to be out of reach and would benefit from a remote control. 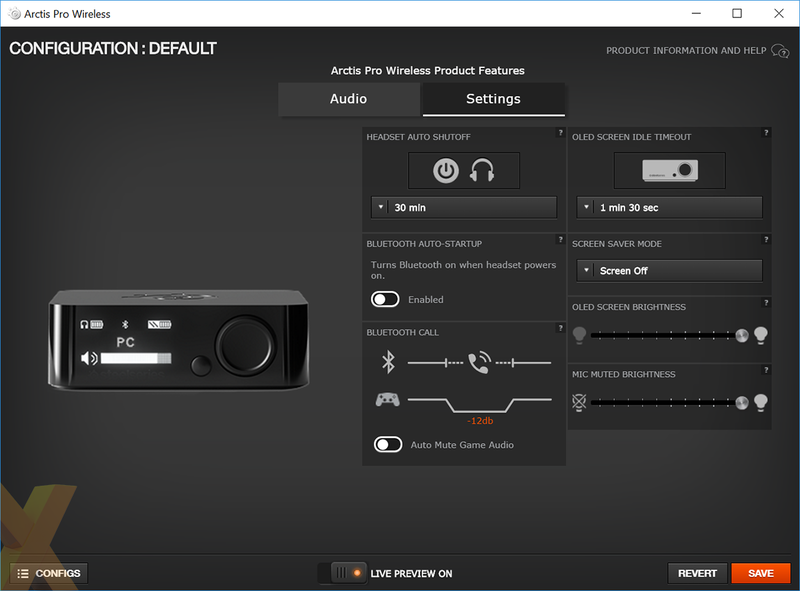 Similarly, if you're looking for a headset to use in multiple locations, the Arctis Pro Wireless probably isn't the best bet - it works a treat when the transmitter is cabled up and in situ, but if, say, you have a PC in the bedroom and a PS4 in the lounge, it's a hassle having to move the transmitter from one room to another. On the plus side, if you are able to keep the transmitter within reach, it can be of value. The controls are easy enough to get around, and digging into the menus allows access to key features such as chatmix (used to find the optimal balance between game and chat audio), sidetone, microphone volume, the ability to toggle DTS Headphone:X v2.0 surround sound, and an equaliser that really needs to be used to get the best experience (more on that later). We quite like having these options available on a hardware device rather than a software utility, and the wireless transmitter is also handy in that it displays battery status and incoming calls via Bluetooth. Given the customisation options available via the wireless transmitter, is there any need to install a software utility? 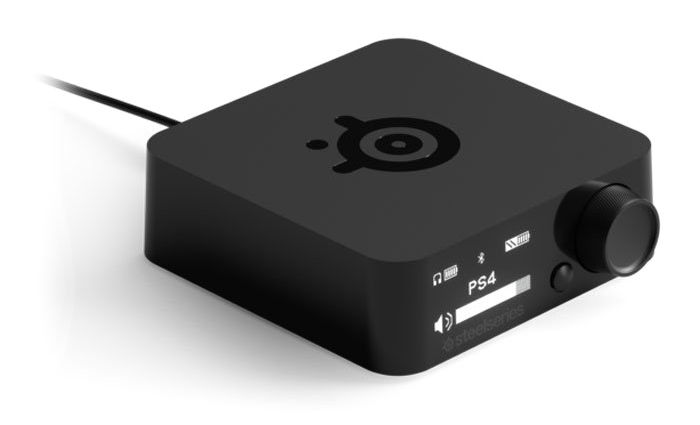 For most users perhaps not, however the free-to-download SteelSeries Engine is currently the only means of carrying out a firmware update, and if you do like to tinker with the equaliser, the on-screen controls are the easiest way to do so. The software covers most of the basics and the settings tab lets you customise the transmitter display as well as define an auto-off time. 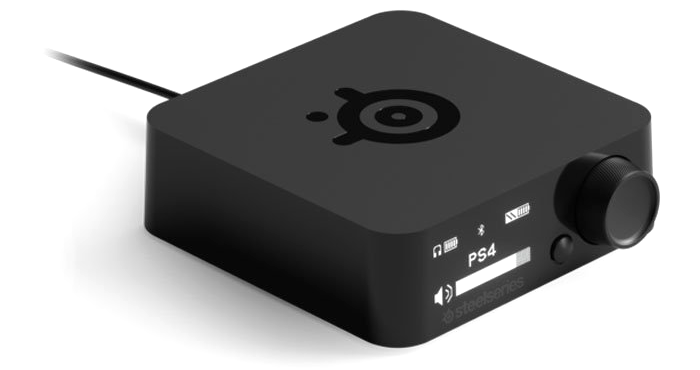 SteelSeries has most boxes ticked, yet at this price point we had hoped to see universal support among the major games consoles. 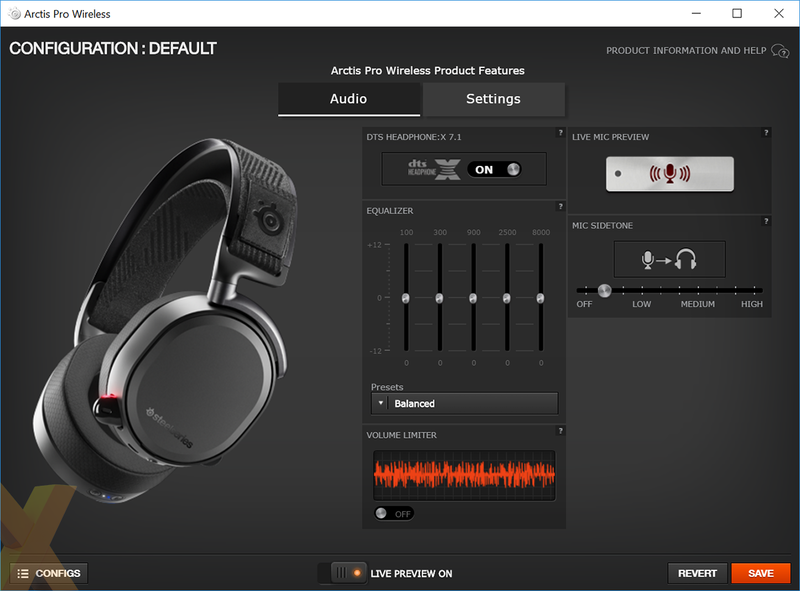 Arctis Pro Wireless is certified for PC or PS4 and doesn't officially support Xbox One, though there is a potential workaround if you get creative with the headset's dual wireless connectivity. In order to make it happen, connect the Xbox to the transmitter via optical for all your in-game audio, then connect the headset to a Bluetooth device loaded with the official Xbox app. Said app can be used for chat, and with the headset mixing the two audio streams, you can play and communicate wirelessly. It isn't ideal, but it's a trick worth knowing about for gamers hoping to use the Arctis Pro Wireless with multiple consoles.